This welcoming rental property is well-suited to groups of friends or families with adult children, who want to explore this Caribbean island from a base of laid-back style and tranquility. 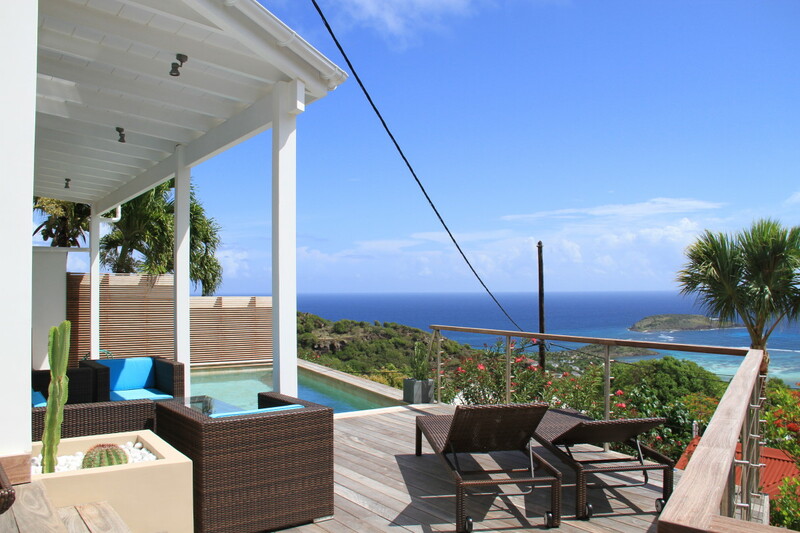 The newly renovated Villa Sergey is located in Vitet, a calm, secluded haven on the east side of the island. The vacation home is close to Hotel Guanahani and Le Sereno, should you want to go out for a three-star meal or an indulgent spa treatment. But ultimately, the charms of Villa Sergey) turn staying put into a very appealing option. The fancies here can take off from your head, as you unwind and relax with confidants and companions. The villa was designed for large-group socializing and more intimate conversations in mind. The compact but well-conceptualized living room, has tremendous ocean views over Grand Cul de Sac, as do the multiple shaded and sunny terraces, as do each of the three bedrooms. Each of these sleeping quarters also occupies its own building, and has its own ensuite bathroom, as well as design flourishes like driftwood sculptures and brightly colored cushions. Every room is big enough to be a “master,” but one is located in the same building as the socializing-ready living room and gourmet kitchen. The others are more private, in their own buildings, and one with a king bed and one with twin beds that can be left separated or pushed together into a king. The décor is winningly minimalist, with splashes of vivid turquoise an crimson, but nothing that would be challenging to live with. It’s what’s outside the floor-to-ceiling windows that command your attention, and your best choice of action is to head into it as Sergey would have—but after his work was done. This is an inspired place to unwind—but with all the comforts the island has to offer, and a thoroughly modern sense of rest. Sergey took device stances throughout his life, but Villa Sergey is also a place to let go of it all, The new luxury home is an island sanctuary: breezy, light, quiet and soft. Just what you want when some days you want to rove, and others you just want to rest.